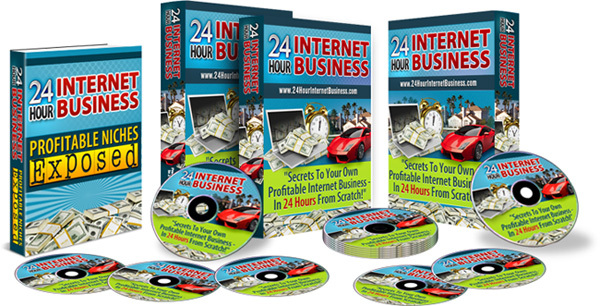 "Secrets To Your Own Profitable Internet Business - In 24 Hours From Scratch!" 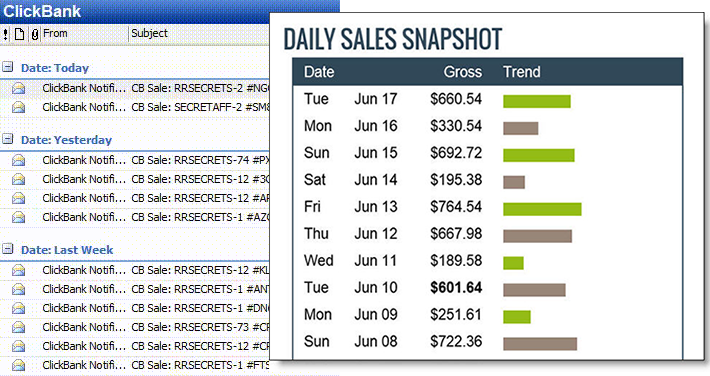 Are you struggling to make consistent money online...or struggling to make any money at all? If you're brand new and haven't made a serious attempt yet, is your brain sore from trying to learn everything the so-called experts say you need to know? Either way, is your wallet sore from buying a bunch of stuff that hasn't paid off, while you're just about to drown from information overload? I wish I could say that wasn't normal, but it is. Most people are so frustrated or cynical about Internet business that they either quit or get bitter. It makes perfect sense - all they've seen is confusion and failure. What's Really Keeping You From Success? Relax. I'm not going to hit you with psychobabble about you how need to "take action" or "just do it" or anything like that. Thinking positively is a great thing to do, but gosh, how positive can you be when you're working yourself to death and you're not making any money? It can be tough to stay positive without seeing some success, no matter how small. So what's in the way? It's not magic. There's no black art to it. It's also not about finding some gimmick that'll disappear like all fads do sooner or later, usually right about the time you start making money. If you don't have that, you've got nothing. All the fancy tools, all the seminars and ebooks, all the effort ...without a plan that consistently pays off, you wasted your time and money on everything. If you've tried and failed, it's because you didn't have a plan like that, or you didn't execute it (maybe because it was too complicated). If you're brand new and you start on the wrong path, you can wander around in the weeks for years, get frustrated and quit before you cash in. Good question, and it deserves an straightforward answer. The simple truth is that I know what you feel like. I've been there. And...here's the important part...I'm not there anymore. It's been quite a while, but I remember it like it was yesterday. I was drowning in credit card debt. I had spent years of nearly sleepless nights (at 3 a.m. after I got home from work) trying to figure out how to succeed. I wanted what you want. The only way I got it was to filter out the noise, find a simple plan that worked and pound on it until I achieved success. Was it hard? You bet it was, but it was worth it. I don't say any of that to boast. Remember, I struggled for years. I wasn't a genius. I had zero clue about Internet business when I started, other than thinking it sounded great. I also almost drowned from information overload, just like you. And then I moved on to trying and failing, and being so frustrated I wanted to ditch it all! Sound familiar? I bet you're somewhere on that path yourself right now, and I've been there before. The good news for you is that I can help you skip almost all of the effort required to figure out what works. Why? Because I know a secret you don't. There are lots of ways to make money online. None of them matter until you've made money one way. Until then, everything else is a distraction that kills your chances. The key is finding that one way. Until you find it, you'll be flailing around searching for it, growing more and more frustrated by the day. That's why I struggled for so long. I found myself distracted by a hundred different things that "could work" instead of concentrating on one thing until it did work. And another thing...it took me years to learn that the business model you use is what really counts. You need a business model that lets you start fast, without having to create your own product, and pays off extremely quickly so you can build on your profits to take your business to the next level. Having your own products isn't bad, and I have plenty myself. But starting there can get you stuck on product creation, which actually keeps you from making money. The smarter move is to make cash first, then spend some of it to create your own products and grow your income even more. Listen, nobody wants to beat his head against the wall trying to succeed. Only an idiot would actually enjoy sweating and missing sleep and giving up family time just to sit and wait every day for money to roll in...and never see a penny. But the sad news is that the vast majority of people who ever try to create an Internet business do exactly that — they work, they wait and absolutely nothing happens. What I'm going to show you is, in a nutshell, the simplest way I've ever found to make consistent, easy, big profits on the Internet. I've been using this very same technique for years, and it still works like you won't believe. I'll even go out on a limb and say that this is almost guaranteed to work as long as the Internet is around. This Is Like A Fill-In-In-The-Blank Business Plan! Yes, it's that easy. I'll give you 9 videos that walk you through everything you need to do. When you hear "9 videos" don't worry. These aren't long videos. You won't be chained to your computer for two weeks just to watch them. Remember, I said you'll be seeing profit within 24 hours, so these videos can't take that long! I've arranged this in bite-sized chunks that make it easy to digest. The rest take less time to watch than your favorite sitcom on television. It'll take you about three hours to get through them all...and your business will be all set up after that. But just because what I'll show you is simple, doesn't mean it's not powerful. Your 9 step-by-step videos walk you through absolutely everything you need to do to create your own business from scratch in less than 24 hours. Like I said, setting it up only takes 2-3 hours. 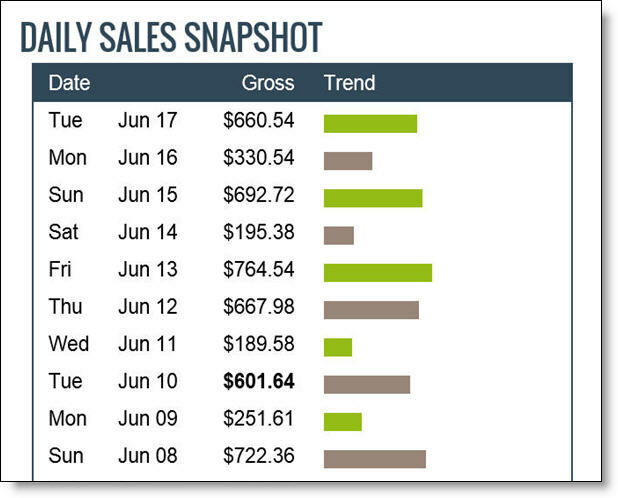 The rest of the time is to let your traffic methods work and start pouring the profit into your account! How to create your own website in less than one minute. That's not a joke. I'll show you how to do it with a few mouse clicks, and your site will look fantastic when you're done. How to set up your domain and hosting in minutes. It's not hard! I'll show you exactly what to do, and walk you through every step. Lots of people get intimidated by the technical stuff, but don't be scared — I'm not technical at all, and these videos make easy even for me. A completely free way to do your keyword research. Very few people like keyword research, because it takes a little effort. But when you do it the way I describe, it doesn't take long, and you'll be excited at every step...because you're finding money words! The quick, simple, nearly foolproof way to find other people's products to promote for a cut of their profits. You'll hear lots of people telling you they've found the "secret" way to find this stuff, but don't waste your time — my way works like a charm, and it's outrageously easy. How to brand your business, and why it's critically important. Most people skip this, and it's a huge mistake. The best business model for your Internet business. 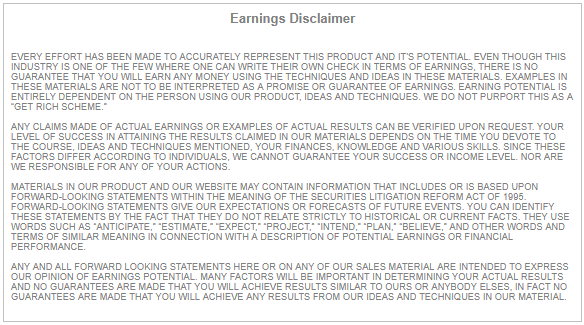 If you use this, you'll cut your time to profit by leaps and bounds...which is why the entire system is based on it. The painless way to have your own website content in minutes.Seriously, that's all it takes. Some options will cost a very small amount of money, but hey, it ain't much when you're getting killer content in less time than it takes to run to the grocery store. How to set up your content schedule. You can even automate this to "drip" your content over time, so you can go on vacation and not worry about it. 3 FREE traffic methods that rock. I'll walk you through each, step by step. I don't care if you've been struggling for years to get traffic to a website, you won't struggle anymore. I'm going to show you how to leverage three completely free sites to send so much traffic to your own site that it'll bust the seams. You don't need any special skills to do this (I'll even point you to a free video tool that a trained parrot could use). To sum up, I'm going to hand you the simplest, quickest, easiest STEP-BY-STEP method I've used for years to build income streams in all kinds of hot niches. You can watch all of the videos in about three hours, and be ready to check your inbox for emails telling you that you just made money! This Is Everything You Need To Succeed! You've probably heard that before, and I bet you weren't happy with what you actually got. I've been there myself, so I know the feeling. But let me tell you this. "24-Hour Internet Business" is literally everything you need to do the thing I said you need to do — succeed with one method. I don't care if you've tried before and failed. Even if you've tried multiple times. I don't care if you're brand new and you're scared to death. Either way, the method I'm going to show you will work. It won't cost you your firstborn. You won't have to work 24 hours a day for the next year. And believe it or not, it'll actually be fun when you see everything come together in less time that it takes to watch a long movie on the big screen. Will there be challenges? Sure! There always are. Your web host will have a hiccup. Your Internet connection will be down so you can't do some of the things you need to do. Some of the work might seem boring and you'll wish it wasn't. But I can also say that you'll have fewer challenges when you're using my system than you would if you had to figure everything out on your own. You'll see more success faster, too. And Yes, I Do Mean Within 24 Hours! Now, about the title I gave this product. I bet you're thinking, "Sure, success in 24 hours...what a crock!" Then you'll need to turn on your traffic machine, which might reasonably take you another 1-2 hours. Okay, now what are the odds that you'll get enough traffic to make a single, solitary sale in the next 20-21 hours after that? I'd say they're excellent..and that puts you in profits within 24 hours. But you know what? Maybe if you take your time, and you're a little scared, and you hit a snag or two, or you have to take your kid to some special event...maybe it'll take you a week to get everything set up. That's obviously more than 24 hours. But here's the important question - do you care? Nope, you don't, because that one sale is more than most people who ever try to make money online ever make. If it takes you 24 hours to see your first profit (which is definitely doable), great. If it takes you a week (which is s-l-o-w), that's just as good! "Okay...How Much Will This Set Me Back?" Each of the videos is worth at least $83. A few are worth way more than that, but let's go with that conservative average for now. So if there are 9 videos, each worth $83...that's $741 of pure value out of what you'll learn. Sound like a hypey big number? Not a chance. Think about it. 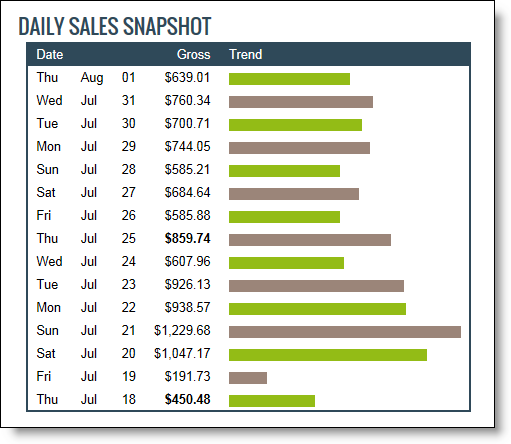 If you set up your site in a day, and you start seeing profits at the rate of even just $50 a day within a week, you'll be making $350 a week at that point. That means the videos will pay for themselves within three weeks! How Does A $97 Exclusive Bonus Sound? 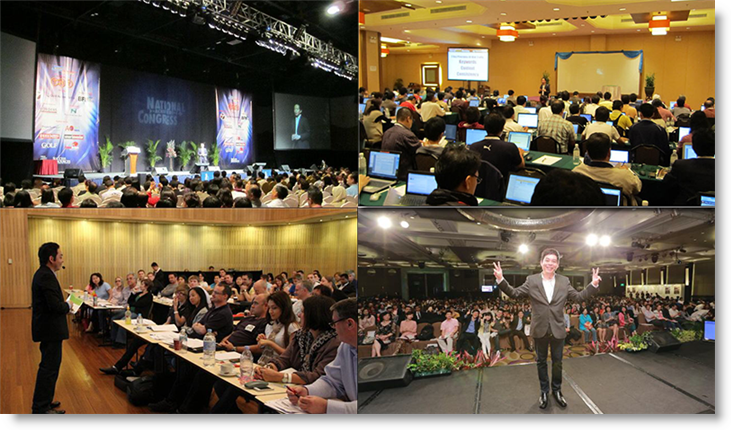 The "24-Hour Internet Business" videos are going to get you up and running fast. But wait a minute. What market should you target? You might say that's the critical question...and I'm going to help you answer it! 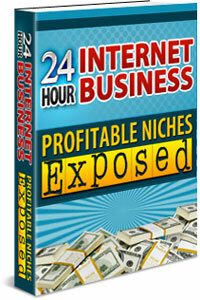 Discover The Top 100 MOST Profitable Niches On The Internet! If you can find a niche crammed full of hungry buyers, you can just about write your own paycheck. Hungry niches buy like there's no tomorrow. All you have to do is put a well targeted product in front of them and they'll whip out their wallets. Finding those niches takes time, though. It also can take gobs of money for paid researchers (I've paid them, so I know). So I'm going to hand you that hard-to-find, often expensive information for free. I've had my own staff research 100 of the top niches on the Internet today. Most of these niches are what you call "evergreen", meaning they'll be hot pretty much forever, because human beings don't change that much! Buyer Profile. I'll tell you what buyers in this niche are hungry for, and what your ideal customer will look like. Their Main Problem. This is the "magic", so to speak. Once you know what problems your buyers are desperate to solve, it's like taking candy from a baby. What Products To Sell Them. I'll tell you exactly what products you should focus on promoting to your prospects. No more wondering! Even better, I'll walk you through how to find hot niches yourself. I'll show you what FREE tools to use, and how to use them. Once you get the hang of it, it's easy and outrageously profitable. This ONE resource is worth at least $97, because of the profit potential inside. I'll value it at that level to be conservative...but you're getting a great deal here! So you're not only getting the "24-Hour Internet Business" videos, but you're also getting a bonus worth another $97. That's a total value of $838! See if this isn't the simplest, fastest, easiest way to build an online business you've ever seen. If you're not happy with your results at any time during those 60 days, I don't want a single penny of your hard-earned money. Simply let me know at any time during that 60 days, and I'll give you a complete refund promptly, and with no questions asked...guaranteed. Remember when I said this was worth $838? I meant it, and I'm sure you see the value. But you won't pay anything close to that. In fact, you won't pay $297 either, which is less than half of what it's worth. You won't even pay $197, which most people I've shown this to suggested I charge as a "great deal". Instead, you'll pay only $27 one-time! You'll get everything, including the 9 core videos and the bonuses. And you'll get to keep all the profits from your own business — I don't get a penny! "Why Does This Cost So Little?" It's a fact that this where Internet marketing gets a bad name. People sell junk for cheap and they act like they're doing you a favor by giving you a "deal". I'm sick of that. I won't play that game. Simply put, I set the price so low on this because I don't need to set it higher. I've already made a fortune online, so I don't need to sell this for some crazy high price to feed my family. But I won't give it away either. I want serious people to grab this, use it and tell my about their success. By pricing it where I am, the bar is so low that I don't think many serious people will be able to turn it down. So, no risk, huge potential for profits from your own business starting one day from right now and you'll pay less for it than you will for dinner and movie for two people. At this point in your Internet business career, you're probably frustrated. That makes it tough to dream. Imagine waking up every morning and strolling to your computer whenever you feel like it. It's stuffed with sales notifications...that came in while you were sleeping. Let me tell you, nothing beats that. Or imagine going on vacation with your family, and not thinking about "work" at all...and then coming back to find your account crammed with profits that piled up while you were off having fun. That might seem impossible, but it's not. In fact, that's the smart way to run a business. If you slave away trading time for money, or you have to be physically working in order to make a profit, you're signing yourself up for hard labor for the rest of your life. In other words, it makes money for you even when you're not "working". And the time you do spend working on your business can be on your own schedule, and it'll pay you back big-time. 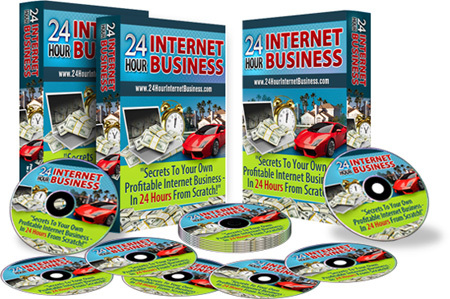 Give Me 24-Hour Internet Business Now! I want your simple, easy, FAST method for setting up an Internet business that'll pour money into my bank account without making me work myself to death. I understand that I will receive INSTANT access after my payment goes through, so I can get started right away, and probably be seeing profit less than 24 hours from right now...instead of being frustrated or wandering around in search of what works. My instant access will include the 9 core videos ($741 value) for Ewen's simple, fast, profitable 10-step system, PLUS the bonus material worth an extra $97. I'll only invest $838 $741 $297 $197 $27 one-time, at least until Ewen decides to bump the price to at least $197. There's zero risk for me, because Ewen is backing this with his 60-day 100 percent money back guarantee. 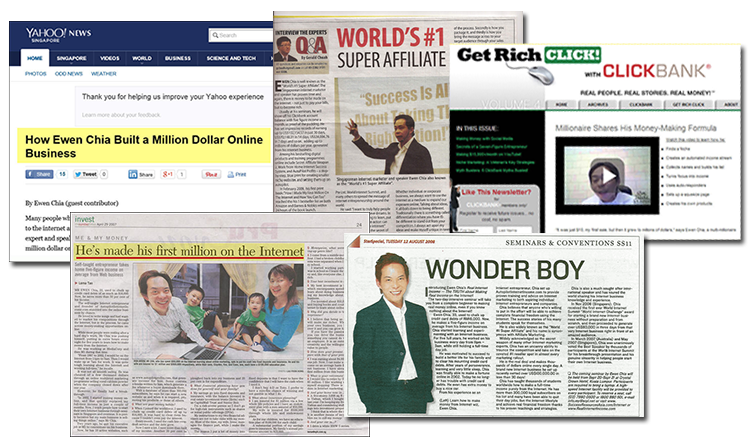 You know that Internet business is a gold mine. You know people are making money hand over fist. But maybe you've been struggling to do that yourself, or maybe you've been so confused that you don't even know how to try. Don't waste time and miss your chance! PS. Are you so frustrated that you feel like giving up? You don't have to suffer anymore. I can put you on the road to success, and you can get there faster you ever dreamed. © Copyright 24HourInternetBusiness.com - Ewen Chia - All Rights Reserved Worldwide.